December 15 is believed to be the National Cupcake Day or the National Lemon Cupcake Day – both variants can be found online. It is a perfect occasion for indulging yourself with delicious small cakes. A cupcake is designed to serve one person. Cupcakes are usually baked in small thin paper or aluminum cups, hence the name. The first mentions of this baked dessert date back to the late 18th century. 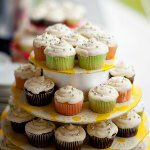 The term cupcake was first used in 1828. Cupcakes have become very popular as they bake much faster than regular cakes thanks to their small size. Cupcakes are made with the same basic ingredients as large cakes: flour, eggs, sugar, and butter. The cupcake batter may have chocolate chips, nuts, raisins, or berries stirred in. Sometimes cupcakes are filled with pastry cream, ganache, jam, or frosting. They are often topped with frosting, whipped cream, sprinkles, sugar paste figures, and other cake decorations. A lemon cupcake is a cupcake made with lemon-flavored batter and/or topped with lemon frosting. Sometimes lemon cupcakes are also sprinkled with grated lemon zest. If you like filled cupcakes, you can fill them with lemon curd. The refreshing taste of lemon-flavored cupcakes is a perfect combination of sweet and sour.